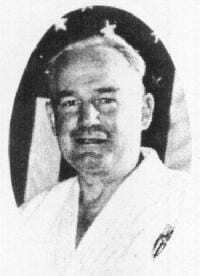 Ray and Marie Law touched the hearts and minds of many thousands of people in the 30 years they actively taught Kodenkan Danzan Ryu Jujitsu in Oakland, California. I, along with Professors Congistre and Rebmann, who were also students of the Laws, feel a deep sense of gratitude and love for these two pioneers of American Jujitsu, as well as a commitment to continue their life’s work. This is their story. Ray law was a first-class publicity man who could easily be ranked Judan in business and marketing. he began his career as Humpty Dumpty the Health Clown in 1927, when he broadcasted health massages over the radio in both Salt Lake City and San Jose. Also during this time, he was a staff lecturer for the California Dairy Council, presenting his health education programs in schools, fairs, and clubs throughout California. Marie Law, who was originally from Alabama, assisted him in these programs with animal imitations, at which she was adept. Professor Law once told me how he and his wife caused an auto accident while driving to a school to deliver a health lecture. They had just given a presentation at another school, and were dressed up in their clown outfits. Another driver approaching from the opposite direction was distracted by seeing the two clowns in the car, and he drove right into the median divider. Marie often told a story of how Master Okazaki once “abducted” her two sons. One day, he found out that the kids were very sick, and he decided it was his responsibility to heal them. He walked into the Laws’ house unannounced, and into the children’s room, tucked one kid under each arm, and took them home with him. In spite of Marie’s protestations, he wouldn’t let them go home until they were well. Professor Law had a life-long thirst for knowledge that was insatiable. For example, when he got back from his stay in Hawaii, he was very interested in learning more about anatomy, so he audited classes in the subject at the University of California. He maintained an extensive library in his home office, which was in a separate cottage. He also had a special interest in metaphysics and the science of mind. He once conducted an experiment at his home with plants to see whether his feelings about the plants might affect their growth. He raised 20 small plants in cartons in his backyard, and treated them all physically the same throughout the experiment, providing them with the same amount of water, sunshine exposure, and nutrients. However, with 10 of the plants, he consistently gave praise and encouragement every day. The other 10 he gave criticism and negative energy. As the experiment progressed, the former group thrived and grew strong, whereas the latter group were stunted in their growth, and many withered and died. The Professor always gave his students ample praise and encouragement, and we all thrived.